common name for certain members of the Polygonaceae, a family of herbs and shrubs found chiefly in north temperate areas and having a characteristic pungent juice containing oxalic acid. Species native to the United States are most common in the West. Eat only the top half of the stem, not the leaf, root or bottom of the stem. The leaf is poisonous.Very good for cleaning out the intestinal tract. Very sour, super tart. Rhubarb contains pectin which is a preservative, so if you add rhubarb to food you are cooking (if you cook your food), the food will not spoil. Produces 2 crops in the year, just before cherries and strawberries in the spring, so you can use it to preserve the fruit, and then again in the fall to help preserve the apples, pears etc. 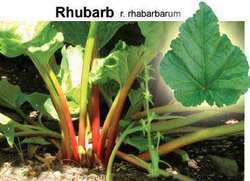 Rhubarb has greenish white or rose reddish clumpy flower clusters. Leaves sometimes confused with burdock, which has “velcro” balls and purplish red spiky flowers. Small amounts of rhubarb root are used as a laxative, but the stem is safer because the compounds are not as concentrated Experiments have shown rhubarb root to lower blood glucose levels in diabetic mice. The stem can be dried and powdered also. What does it mean when you dream about rhubarb? The bitter rhubarb plant, which takes on a sweet flavor when cooked with sugar, is a symbol of taking the good (sweet) with the bad (bitter). Because it is often used as a purgative, it can also represent freeing oneself of something unwanted. Rheum rhaponticum. A herbaceous perennial of the order Polygoniales grown for its thick, edible petioles.